I gathered my edible flowers and herbs from the garden first. Cucumber makes the sweetest and vibrant edible flowers like ever. I picked cucumber flowers and fresh mint from the garden. I also love the calm fragrance of lavender in vodka cocktails so I pulled a few lavender sprigs as well. Next, I used a store bought berry medley of strawberries, raspberries and blueberries to make decorative ice cubes. 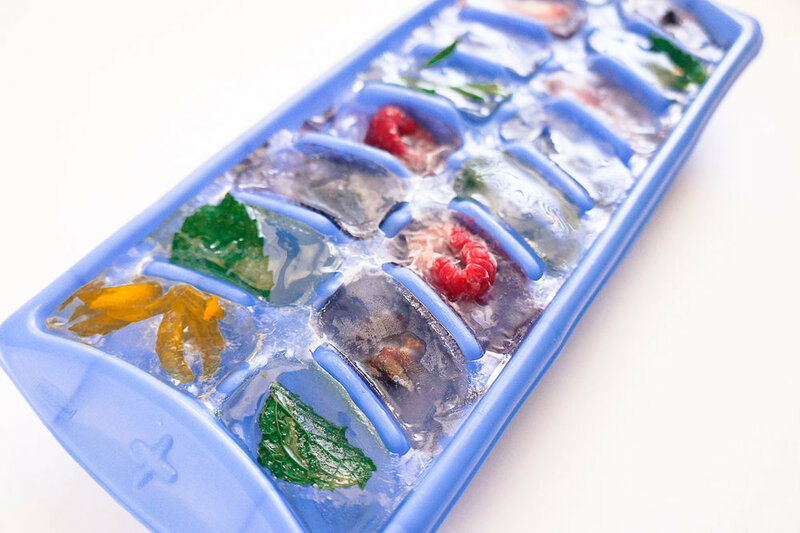 Add the flowers, herbs and fruit to ice cube molds and continue adding water until the mold is filled. Next, place them in the freezer and wait patiently for the ice cubes to freeze. Using your beverage of choice, simply place the ice cubes in a glass and pour your beverage and enjoy!! !